Inform your friends about Boris and his izbornom programu. 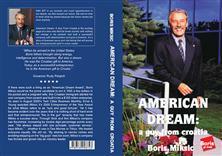 (Croatian Spring) which eventually led to his emigration to the U.S.A.
and lobbied politicians in Washington, D.C.
* He is Honorary Consul General of Croatia to the U.S.A.
What does Miksic stand for? Why haven't people heard about Miksic? Croatian media had not been covering his campaign. http://www.borismiksic.net/ for more information about Boris Miksic and his campaign. Miksic is the only candidate who truly represents a change for Croatia. Take a look at what the current Croatian President has done for Croatia in the last 5 years. Take a look at what the current ruling party in Croatia have done in the last year. Let's all do our part to get Boris Miksic into the President's Office. and what identification you need to bring with you.